Rewards Canada: July 30 Update: Three Canadian Hotels in the latest IHG PointBreaks, some BMO card changes coming and playing catch up! July 30 Update: Three Canadian Hotels in the latest IHG PointBreaks, some BMO card changes coming and playing catch up! Rewards Canada was off last week for some R&R but of course that was interrupted with the Air Canada news that they along with TD, CIBC and Visa want to buy Aeroplan from Aimia so we did a lot of interviews about it from Southern California! We'll have full coverage of that news tomorrow and we'll also play catch up on other news from mbna (not good news), Aeroplan (the transfer bonus is back), WestJet and more. Last week the newest IHG Rewards Club PointBreaks were released, we prescheduled our post as we were travelling when it went live so we couldn't cover what Canadian hotels were on the list and really not much was missed. Only three Canadian hotels were included this time at the 10,000 point level. 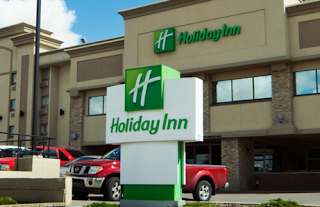 The Holiday Inn Calgary-Airport, Holiday Inn Express & Suites Terrace and Staybridge Suites London are the hotels being offered at a discounted rate. You can find all the details here. Jsut a heads up - some BMO credit cards will have some slight changes coming to them on August 8th. Keep an eye out on our blog for that news in a little over a week! Amex Membership Rewards to the new Marriott Rewards/Starwood Preferred Guest program conversion rate is here! Save up to 15 % on Marriott stays in Canada! Book at a participating hotel by August 1, 2018 for stays until August 31, 2018 and save up to 10% on best available rates! Marriott Rewards® Members save up to 5% more. Find out more here.